A long time ago, I did a PhD in organic chemistry. During that time, I also started a career in educational publishing. I left that in 2011, to take an MSc in Information Systems Development. Along the way, I developed an interest in way humans use technology to do democracy. Because research in this area calls for very different skills to those used in physical science, I’m always on the lookout for ways to augment my research skills. So I was happy to spend 3 days this week at Napier’s Researcher Skills Forum. Here’s the programme, and the following is just some of what I learnt and enjoyed. 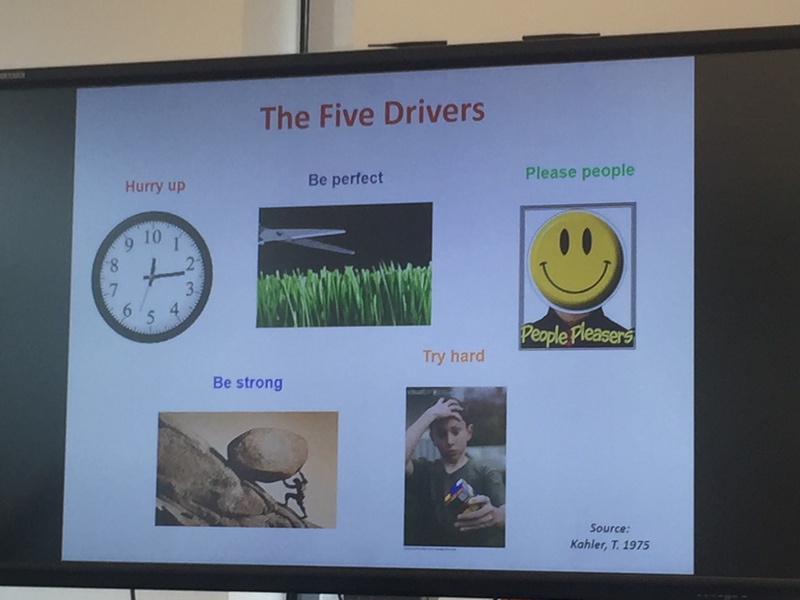 The following session on Waving not drowning – How to keep afloat in the choppy sea of research was mostly about maintaining mental health while studying. That brought back memories of some deeply unpleasant times in my past. I’m not going to parade them in this blog, but I would say that if you’re experiencing problems, talk to someone and get help. (And have a look at the Shelf Help resource.) You won’t be the first, or the last, to suffer such issues, and my experience is that Napier is generally very supportive of its students and staff. Click the thumbnail to see the full-size image. Wednesday started with an active session on research methods. 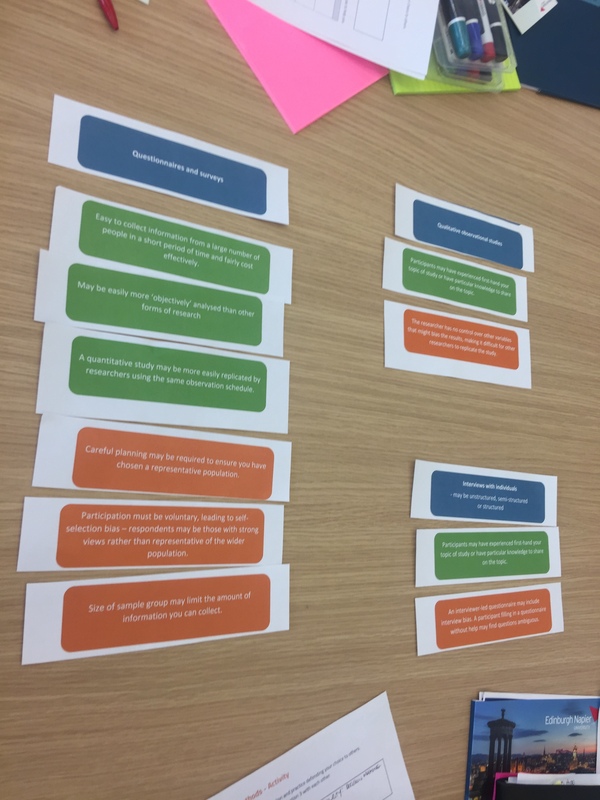 The teaching included a formal definition of paradigm**, but the fun part was group-work: making up a research question that combined group-members’ interests, then finding relevant research methods and matching them to likely strengths and weaknesses. My group’s RQ was what cultural aspects surrounding SMEs affect their cyber-security? The photo shows our methods, strengths and weaknesses. I’d also suggest reading this Research Methods Resource List (PDF). Another session that morning focussed on open access in the research context. My take-homes are Napier’s open access policy, including the exhortation to act upon acceptance, i.e. as soon as an output is accepted for publication, it should be put in your institution’s OA repository. This ensures output is eligible for REF, and (for me) means you don’t have tasks hanging over you – and eventually forgotten. There’s more on Napier’s OA blog. Another session on Wednesday was a panel discussion on Developing your career – Real life journeys. There was too much in that to précis here, so watch the video when it comes out. The final session on Wednesday was on time-management. 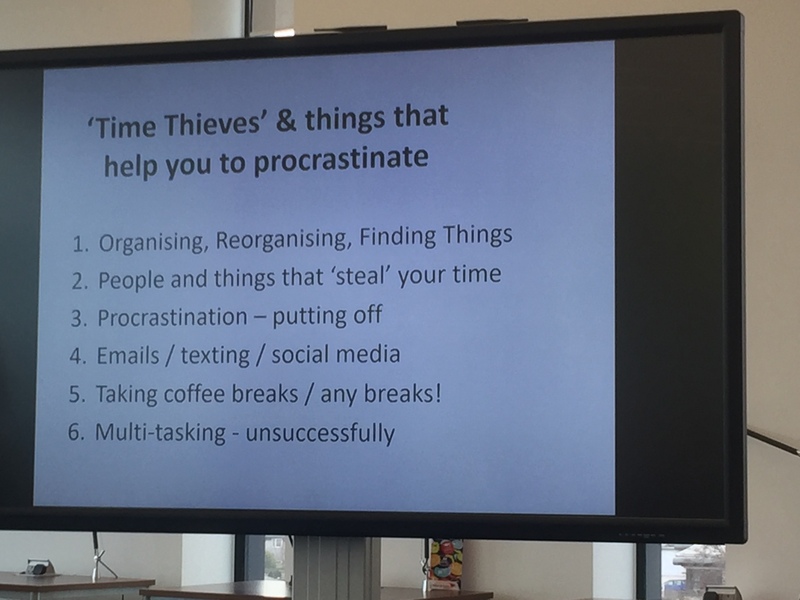 It was illuminating to work out how much time-thieves cost me, and what drives me to carry on with my research! In your literature review, you should also consider papers by … These have now been added, in paragraph xyz on page abc. because it clearly shows to the editor – who will decide whether to publish the paper – that authors have acted on feedback. It was also suggested that it’s never too soon to make contact with editors, and become a reviewer. The final session I attended was about the Scottish Parliament Information Centre (SPICe). It was surprising to learn how many people confuse Parliament with Government, but I guess I’m in a privileged position from being married to a senior civil servant. SPICe commissions and writes briefings for MSPs, so maybe your research can influence what happens nationally. I didn’t stay for the session on Mendeley – I use this reference-manager most days, and I had two funding applications to finish. I’m very grateful to Grainne, Eithne Barry and their colleagues for such a useful set of sessions, so I’d strongly recommend that any fledgling researcher attends events like this. It was very worthwhile, despite the two fire alarms. * PhD students are not entered into REF, but having papers entered into REF can boost CVs. ** A paradigm consists of: an ontology (roughly, a description of reality), an epistemology (roughly, what is knowable and who can know it), and a methodology (roughly, how knowledge is obtained). This entry was posted in democracy, other research, study by Bruce Ryan. Bookmark the permalink.